Mrs Surangkana, president of ETDA, says a digitally skilled workforce will serve industry trends. By 2023, ETDA wants to have 8 million workers and 1.6 million micro small and medium-size enterprises (SMEs), with local merchants selling products in China in collaboration with Dongguan China Council for the Promotion of International Trade. 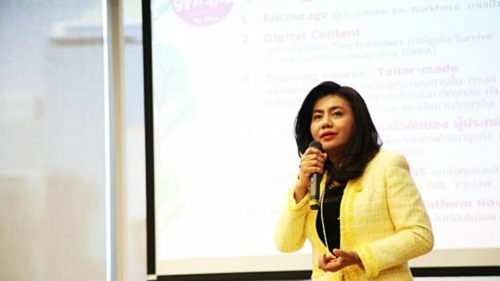 "We see potential growth for e-commerce business if Thais act now and build a digitally skilled workforce that serves the industry trends," said Surangkana Wayuparp, president of ETDA. The agency earlier predicted Thailand's total e-commerce market value at around 3 trillion baht in 2018, growing from 1.8 trillion in 2017. The official figure will be announced at Thailand's E-commerce week 2019 to be held from Jan 31 to Feb 2. Inspired by the Dongguan model, which is the No.1 e-commerce district in China boasting 2,000 e-commerce parks, ETDA is setting up the first e-commerce park in collaboration with Srinakharinwirot University to be a centre of education, training and cooperation, with overseas agencies working to create a smooth channel for Thai entrepreneurs exporting their products to the global market.